Musa warded at IJN | Daily Express Online, Sabah, Malaysia. 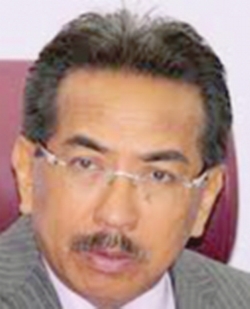 Kota Kinabalu: Tan Sri Musa Aman (pic) will continue to fully cooperate with the authorities, including the Malaysia Anti-Corruption Commission (MACC), despite being admitted to IJN, according to his counsel Ridha Abdah Subri.He said his client also hoped that any interview session to record his statements could be conducted soonest towards assisting their investigations. "Musa was present at the MACC headquarters in Putrajaya on Thursday (Sept 6) to give his full cooperation to the concerned authority. "However, during the interview session, MACC made an observation on the health condition of Musa which was not satisfactory. "Hence, he (Musa) went to seek the advice of cardiologists at the National Heart Institute (IJN) and medical examination was carried out on him," Ridha said in a statement, Friday. The former Chief Minister was then warded for further medical check-up and treatment by the cardiology experts. On Wednesday, Musa was sworn in as Sibuga Assemblyman in the State Legislative Assembly when he returned to the State Capital in the afternoon. He returned to Kuala Lumpur at about 10pm the same day. The national media reported on Thursday that Musa's presence was requested by MACC to shed light on several allegations made against him dating as far back as 2009.